Tyres have an enormous impact on the operation of a fleet. As well as the safety benefits of having the right tyres in the right condition, buying them has significant cost implications: they can account for more than 50% of a fleet’s service, maintenance and repair (SMR) budget. And this could increase further with the relentless growth in specialised wheel and tyre sizes as they become more model specific, says Ashley Sowerby, managing director of fleet management software provider Chevin Fleet Solutions. “When you look at operational data, this is not just a question of bigger tyres being more expensive, but also seemingly more susceptible to accidental damage and even more likely to be stolen,” he adds. “All of these factors lead to higher costs and fleets are increasingly trying to take managerial control in this area. “This is something that is being seen on a wider industry basis with some of the largest fleets changing their buying arrangements. Choosing the right method of tyre procurement can have significant cost benefits: for example, estate agent Countryside has saved more than £100,000 since switching from pay-on-use to a fixed monthly fee in 2010 (see case study, page 33). However, John Pryor, chairman of fleet operators’ association ACFO, says there is no one-size-fits-all solution for all fleets. “Any decision taken over tyre policies should depend entirely on the diversity of each individual fleet,” he says. “But I suspect that many fleets still think, when they lease vehicles, that they want to include tyres in that policy. “In my experience, most of the largest fleets have contracts in place with the leasing companies and tyre manufacturers, while smaller fleets tend to deal with fast-fits and dealers directly. Here we look at the three main ways fleets procure their tyres. Fleets who lease their vehicles usually have the option to add tyres to their package, and these are often contained within an SMR agreement. These give companies a fixed monthly cost which enables budgets to be maintained, while the agreements typically include unlimited tyre use, including those damaged through normal use like punctures and sidewall damage. Vandalised, stolen tyres, or those damaged in an accident, are normally covered by the customer’s vehicle insurance policy although some leasing companies offer a separate tyre insurance policy. The fixed monthly cost means fleets are protected against any increase in tyre or fitment costs, according to Toni Landauro, strategic account manager at Hitachi Capital Vehicle Solutions. Leasing companies will also manage suppliers from ordering parts to final fitment, which can be done by a mobile fitter at the workplace, reducing vehicle downtime. “Billing is also centrally consolidated, reducing admin time on the customer side,” adds Landauro. Another benefit of having a tyre agreement in place with a leasing company is that it also guarantees a high level of service, says Simon Pilcher, supplier manager at LeasePlan. Landauro adds that some customers still wrongly believe that leasing companies will change tyres “unnecessarily or ahead of schedule”. “We work with our customers to set and enforce a tread depth limit for when tyres are changed,” she says. Pilcher says leasing companies also provide additional services that are not routinely available to fleets going directly to fast-fits or dealers, such as 24/7 emergency cover, mobile fitment, guaranteed booking times and fleet safety checks. However, Justin Patterson, head of operations at London-based private hire taxi firm Addison Lee, believes there are drawbacks to using leasing companies to supply tyres. “In my experience, the large leasing companies give no visibility of tyre costs within their SMR budgets, and the majority do not pass on their rebates that are com- monly negotiated with tyre manufacturers and distributors,” he says. “As tyres can form more than 50% of an SMR budget, it is a critical element of cost to understand. Addison Lee uses family-owned fast-fit Universal Tyre and Autocentres to fit Michelin tyres across the majority of its 5,000-strong fleet on a ‘pay-as-you-go’ basis. Procuring your tyres through a fleet management company has many of the same benefits as opting to buy them via a leasing company. Fleet management companies also sell their services on the basis that they have significant buying power with suppliers and tyre manufacturers, which can result in them being able to secure good deals. Like leasing companies, many offer all-in-one packages with the client paying a fixed monthly cost for a range of SMR services that includes tyre procurement. Mike Cooke, fleet operations manager at FleetEurope, says many fleet management companies also bring with them a “level of expertise in formulating tyre policies” which ultimately ensures the most appropriate deal. “Where tyre suppliers, garages and tyre manufacturers will push certain tyres to retail buyers throughout the year at extremely competitive prices in order to balance stock levels, our price is consistent throughout the year for one brand of tyre in a specific size, no matter where the fleet is located,” he says. As a general rule, all regular and irregular tyre wear – as well as punctures – are included in these policies. Companies such as FleetEurope also arrange for adjustments to be made to tracking at a suitable time for the client. But some fleet management company agreements don’t include any impact and sidewall damage, damage caused by driver error or any habits behind the wheel that directly impact on the tyres’ condition. In addition, some offer a pay-as-you-go option, where clients receive the same service, but on a pay-on-use basis rather than a fixed monthly fee. Cooke adds: “We ensure that repairs are made at a location to suit the client, minimising downtime and expense to their business. Many fleets opt to procure tyres directly from fast-fit or franchised dealers due to the greater cost transparency they feel it gives them. In short, they simply pay for what’s used or repaired and this price isn’t tied into a SMR package or insurance product. Fast-fits are also responding to market pressures to ensure that they provide the best possible service. For example, Kwik Fit uses marketplace intelligence and customer order profiling to ensure that its 600-plus centres are stocked with the most popular tyres across different sizes and brands. Peter Lambert, fleet director at Kwik Fit, says: “A sole-supply business partnership with a fast-fit supplier delivers financial savings related to the volume of tyres purchased and, critically, business efficiency benefits as vehicle downtime and driver inconvenience will be reduced. “A sole-supply arrangement enables us to plan ahead and order the appropriate volume of tyres, brands and sizes related to the individual fleet profile potentially 12 months in advance based on historical fitment data and knowledge. “What’s more, the tyres can be conveniently stored at centres appropriate to a fleet in readiness. Over the next few weeks, Kwik Fit is due to launch a fleet web booking service which will enable drivers to make an appointment at a centre of their choice after checking its tyre stock. David Howe, manager of UK fleet business for Goodyear Dunlop, adds that some fleets find it beneficial to maintain separate relationships with a tyre manufacturer and a fast-fit provider to allow them to “focus on different areas”. “Ultimately, this maximises the value of each relationship,” he says. “For example, ensuring the tyre policy for the vehicle portfolio and operations of the fleet is optimised with the tyre manufacturer, while focusing on customer service and the customer journey with the fast-fit provider. Landauro says fleets should always look for their fast-fit or dealer to “add value”. “If a customer can find a local fitter with the right tyre in stock, they may be able to purchase it from a local supplier at a lower cost, but this price will be hard to predict,” she says. “Operators who choose to procure tyres directly are also often reliant on their drivers reporting issues. “These are often reported to line managers before being passed on to finance departments for approval. “This approach is somewhat flawed, reliant on those whose function is not primarily focused on vehicle safety. ■ One supplier manages all aspects of the tyre procurement and maintenance for a fixed monthly cost. ■ All risk transferred to the leasing company. ■ Paying for tyres that don’t require changing – especially on new vehicles during the first year of the contract. ■ Potential for rebates enjoyed by leasing companies not to be passed on to customers. ■ Potential cost savings due to bulk buying power and high level of expertise. ■ Policies can be tailored to meet individual needs – including option to pay-as-you-go. ■ Check the smallprint: contract might not include tyre impact and sidewall damage or any damage caused by driver error. ■ Ease and convenience: fleet drivers simply go to the nearest fast-fit or dealer. ■ Outstanding level of knowledge with many fast-fits enjoying longstanding relationships with tyre manufacturers. ■ With the sizes of tyres constantly burgeoning, there’s a possibility that a desired tyre might not be in stock. ■ Reliant on drivers reporting issues. Britain’s largest estate agency Countrywide has made savings of more than £100,000 on the cost of its tyres since 2010 after switching from pay-on-use to a fixed monthly fee. Countrywide became the first customer to piggyback a deal between Zenith, then trading as Leasedrive, and Kwik Fit in order to cut costs without losing the convenience of using a fast-fit. Group fleet manager Peter Jardine presented the potential cost savings arising from changing Countrywide’s tyre policy to the group’s chief financial officer after taking up his position in 2010. Today, the fleet consists of 4,998 vehicles, which are all cars apart from 50 vans and six motorbikes. Jardine says: “I could see clear savings that would ultimately result from this policy with Zenith and this has proved to be the case. “But, on paper, it wasn’t the best deal in terms of value in its first year as around 50% of our fleet, which are all on four-year cycles, was replaced. “Experience told me that new vehicles don’t generally need their tyres replacing so regularly and this was the case in that first year. Today, Countrywide’s drivers know that their tyres will be replaced or repaired by Kwik Fit if the tread has reached 2mm, if they’ve suffered a puncture or if the tyre has been damaged through being kerbed or vandalised. When Steve Haigh took up his position as group transport manager at Rhodar in 2010 one of his priorities was to re-structure how the company’s tyres were procured. Until then, the company had sourced its tyres through leasing companies, which Haigh didn’t believe always resulted in the best products being fitted or, indeed , the best economies being enjoyed. Tyres were therefore removed from the contracts to allow Rhodar to choose which brand of tyre was fitted on a pay-on-use basis. Today, the specialist asbestos removal company operates 180 vans and 80 cars with Michelin tyres fitted by ATS Euromaster across the entire fleet. In addition to being able to take their vehicle to one of the fast fit’s premises, ATS Euromaster’s team also visits Rhodar’s sites regularly to carry out tyre safety checks. Also, if a driver experiences a blow-out, ATS is contracted to replace or repair that tyre at the roadside. “In my experience, if you buy a premium tyre you get a length of use from it that you might not otherwise get – and that ultimately proves to be most cost-effective,” says Haigh. “Our tyre bill undoubtedly went up over the first 12 months, but after that we started making savings as the tyres needed changing far less than had previously been the case. Its a funny old business, fleets often won't allow driver to take cash options now and manage their own car because of duty of care concerns the drivers cannot be trusted to do it safely. Yet are happy for their drivers to be running around on 2mm of tread which in a country as prone to rapid volumes of rains as the UK is a nightmare. As its your own personal safety at risk I certainly would never have done so when I managed my own vehicle! It is also worthwhile considering for planned purchases low cost/highly customer focussed digital companies with broad independent garage networks such as Blackcircles who have now entered the fleet market. 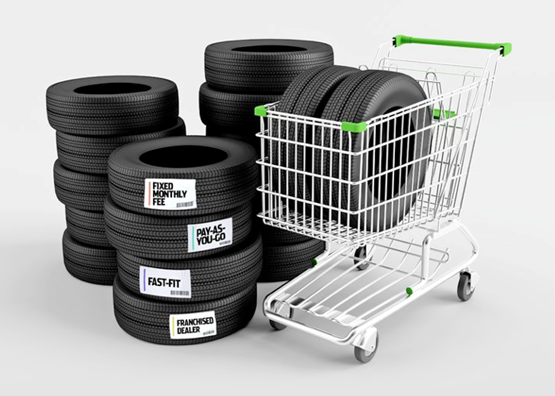 They can provide great value for planned tyre purchases.